During October 2005, my 5 year old grandson, Alasdair, told me the following story of the Invicta which he had seen on a school visit to the Canterbury museum. Invicta had been built by Robert Stevenson and brought by sea from Newcastle to Whitstable. To get it to Canterbury, it had to be pulled up the hills by steam engines which were at the top of the hills. This sounded so like the Dundee & Newtyle Railway, which I had been researching for this web-site that I had a look on the internet for more information. I was fascinated to see the parallel development of rail links at two ends of the country. This extract from "The Romance of a Railway" by Rev. R. B. Fellows, which was published to celebrate the centenary of the Canterbury & Whitstable on 3rd May 1930, gives a good overview of the story. The railway was incorporated in 1825 and purchased in 1853 by the South Eastern Railway. The line was conceived as an alternative means to the turnpike road for the conveyance of coal and merchandise between Canterbury and Whitstable harbour. The survey for the project was done by William James who was a leading promoter of railway schemes. Of three proposed routes, the most direct of about 7 miles was chosen despite involving tunnelling and heavy gradients. George Stephenson was appointed engineer when it was discovered that the original costs had been underestimated although he only visited the line once or twice. His son Robert Stephenson supervised the construction work which took some 4 years to complete. Because of the heavy gradients, wagons were rope-hauled by fixed steam engines at Tyler Hill and Clowes Wood. The last two miles of the route in Whitstable were worked by the locomotive "Invicta" which was modelled after "Rocket". However, "Invicta" was found to be inadequate to haul trains up the incline from Whitstable Harbour to Church Street and a third fixed steam engine was therefore placed at the top of the Church Street incline whilst "Invicta" continued in use for some years on the mile of level track between the new engine house and Bogshole (which is at the foot of the incline up to Clowes Wood). In 1839, "Invicta" was offered for sale as the three stationary engines were found to be adequate for working the whole line. The one enquiry came to nothing and the locomotive was put under cover. For many years "Invicta" was displayed by the city wall and Riding Gate in Canterbury. The photograph (above) was taken in 1968. 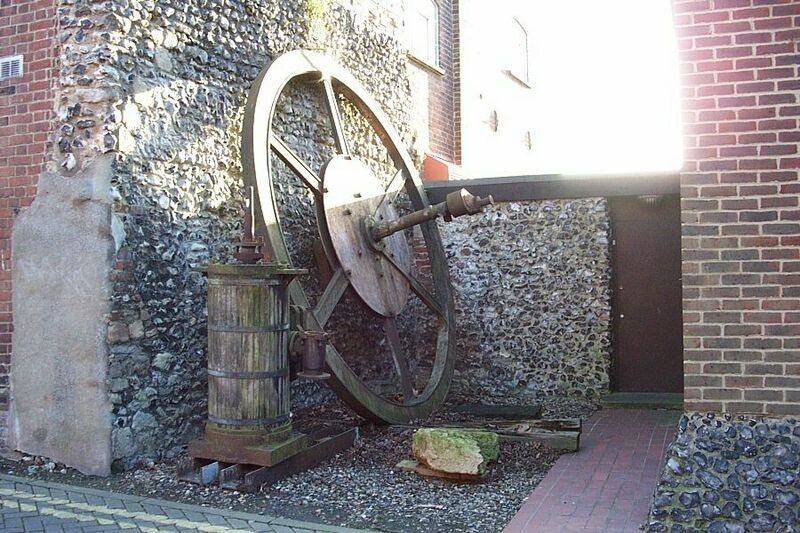 (The other photo shows a fly wheel from one of the static engines: it is in Gas Street, outside Canterbury Castle. Shortly after I took this picture, the museum was persuaded to put the cylinder, which was beside the fly wheel,into storage.) In 1846 The South Eastern Railway reached Canterbury and acquired the Canterbury and Whitstable Railway in 1845. The branch was relaid with heavier rail and locomotives replaced the stationary engines. Journey time was about 20 minutes with no intermediate stops (the halts at South Street, Tankerton and Tyler Hill were opened much later). Passenger services continued until 1930 with final closure of the line on 1st December 1952.